It should be clear by now that economics covers a lot of ground. That ground can be divided into two parts: microeconomics focuses on the actions of individual agents within the economy, like households, workers, and businesses; macroeconomics looks at the economy as a whole. It focuses on broad issues such as growth, unemployment, inflation, and trade balance. Microeconomics and macroeconomics are not separate subjects but are, rather, complementary perspectives on the overall subject of the economy. To understand why both microeconomic and macroeconomic perspectives are useful, consider the problem of studying a biological ecosystem like a lake. One person who sets out to study the lake might focus on specific topics: certain kinds of algae or plant life; the characteristics of particular fish or snails; or the trees surrounding the lake. 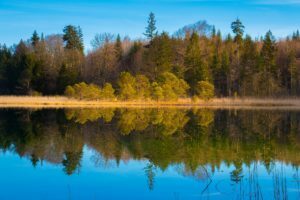 Another person might take an overall view and instead consider the entire ecosystem of the lake from top to bottom: what eats what, how the system remains in balance, and what environmental stresses affect this balance. Both approaches are useful, and both researchers study the same lake, but the viewpoints are different. In a similar way, both microeconomics and macroeconomics study the same economy, but each has a different starting point, perspective, and focus. Figure 1. Macroeconomists might look at the larger ecosystem in this image, while a microeconomist would focus on specific features. Whether you are looking at lakes or economics, the micro and the macro insights should illuminate each other. In studying a lake, the “micro” insights about particular plants and animals help us to understand the overall food chain, while the “macro” insights about the overall food chain help to explain the environment in which individual plants and animals live. In economics, the micro decisions of individual businesses are influenced by the health of the macroeconomy—for example, firms will be more likely to hire workers if the overall economy is growing. In turn, the performance of the macroeconomy ultimately depends on the microeconomic decisions made by individual households and businesses. What determines the products, and how many of each, a firm will produce and sell? What determines what prices a firm will charge? What determines how a firm will produce its products? What determines how many workers it will hire? How will a firm finance its business? When will a firm decide to expand, downsize, or even close? In the microeconomic part of this text, we will learn about the theory of consumer behavior and the theory of the firm. What determines the level of economic activity in a society or nation?—that is, how many goods and services does it actually produce? What determines how many jobs are available in an economy? What determines a nation’s standard of living? What causes the economy to speed up or slow down? What causes firms to hire more workers or lay them off? Finally, what causes the economy to grow over the long term? Monetary policy, which involves policies that affect bank lending, interest rates, and financial capital markets, is conducted by a nation’s central bank. For the United States, this is the Federal Reserve. Fiscal policy, which involves government spending and taxes, is determined by a nation’s legislative body. For the United States, this is the Congress and the executive branch, which establishes the federal budget. To keep the differences between these policies straight, remember that the term monetary relates to money, and the term fiscal relates to government revenue or taxes. These are the main tools the government has to work with. Americans tend to expect that government can fix whatever economic problems we encounter, but to what extent is that expectation realistic? These are just some of the issues that will be explored later in this course.